Sustainability has played a vital role in construction and development for the last few decades, but is growing in popularity. Generation Y is at the forefront of the sustainable living trend. They enjoy living in homes that employ water and energy efficient amenities. Implementing sustainable design features and products within a property can reduce water consumption, which not only assists with water sustainability but will also save homeowners a lot of money in the long run. According to the Australian Bureau of Statistics (ABS) household water prices have gone up 11 per cent over the last year. Households consumed 1,715 gigalitres, (11 per cent), mining 677 gigalitres, (4 percent) and manufacturing 557 gigalitres, (3 per cent). In total, households spent over $4.3 billion on water and industry spent around $2.7 billion. Bathrooms are one of the most used rooms within the home, so it is not surprising that bathroom water usage accounts for approximately 49 per cent of water usage in the entire home. 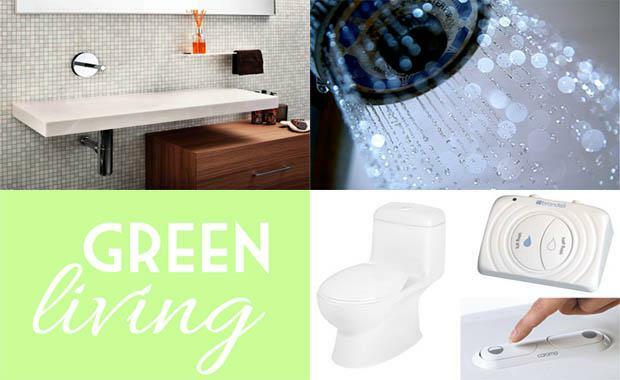 Depending on the type of fixtures used in your home, it is possible to reduce bathroom water usage. Choosing shallow basins, low flow showerheads and dual flush toilets will further reduce household usage. According to Clean Up Australia, the shower is usually the largest consumer of water in any household. Installing a water-saving showerhead and a timer in your shower can dramatically reduce your water use. Second to the shower is the toilet as a big consumer of water in the household. Installing a dual flush toilet can save you thousands of litres per year. If this is too expensive you may want to consider putting a brick or in your toilet cistern to reduce the flush volume. Old-fashioned toilets may use as much as 12 litres per flush, while new dual flush toilet can use as little as 6 litres for a full flush and 3 litres for a half. An innovative eco-friendly design called Drop-A-Brick replaces the old trick of placing a brick in a toilet's tank to save water. However unlike a real brick, Drop-A-Brick won't ruin your toilet. In fact, it actually improves flushing performance, all while saving about 50 gallons a week. Similarly the AQUS® Water Reuse System is a great way to save water in the bathroom.The AQUS System is a small scale grey water recycling system that treats and recycles waste water captured from the bathroom sink to flush the toilet. The AQUS accomplishes wastewater reuse via a simple and easy to install system which is patented and supported by the eco community. The recent reinvention of the basin is revolutionising bathroom design. A shallow basin firstly serves the purpose to create a sleek modern bathroom, whilst the splashback basin helps minimise the amount of water used. At first the basin can be seen as a water waster, splashing water from the flat surface onto other surfaces in the bathroom, however its purpose is to educate the user the amount of water needed to complete the everyday bathroom errands. The slower the water flows, the less splashback received. Installation of a dual flush toilet will save approximately 20 per cent water usage in comparison to a older style toilet. Water-efficient toilets use only 3 litres of water, when on half-flush, while an older model single flush toilet can use up to 12 litres of water. Replacing an older design single flush toilet, with the more recent dual flush toilets saves on average 51 litres per person, per day. The use of a water efficient dual flush toilet reduces household water use by around 35,000 litres per household each year. A standard showerhead uses on average 20 litres of water per minute, while a water efficient showerhead is capable of reducing the amount to as little as 6 litres per minute. Replacing your old showerhead with a modern water efficient showerhead saves around 11,000 litres of water per household each year. Water efficient showerhead not only reduces the amount of water use, but also saves energy, as less energy is used with the minimised use of hot water.